Never, Ever, Say ASAP to a Printer. Here we are at the beginning of a new year, so it’s a great time to talk about planning. Whether you are a person who likes to plan in advance or hates to plan in advance, there is no downside to advance planning for print jobs. And, lucky for you, the printer actually does all the planning, you only need to get a file due date from your printer and work backward from there to your final approval date from your client (or boss). To be clear, in what follows below, one day means one working day. Depending on your printer’s schedule, a work day might only be weekdays, or it could include weekends too if the print shop is running six or seven days a week. If your printer says 7-day turnaround does he mean Monday to Monday or Monday to Wednesday? Right. You don’t know unless you ask. And NEVER, EVER tell your printer ASAP when they ask when you need it. Your rep has no idea what ASAP means. When a job hits production with no due date, that means as soon as “possible” and if there are a week of emergencies with due dates in front of your job… you guessed it. The unscheduled job sits. And sits. I have seen it happen too many times to count. A good rep will pin you down and ask you what you mean by ASAP, five days? ten days? Everyone has a different definition. A great rep will never create an expectation they cannot meet because the difference between expectation and reality is stress. Having said that, sometimes it is helpful to have a ballpark production schedule before you agree to take on a project. If there isn’t enough time, do you want to work day and night on your end to meet a file deadline? Is overtime in the budget? Will your client cooperate with copy and internal approvals? Exactly. Now you know where I am going with this. 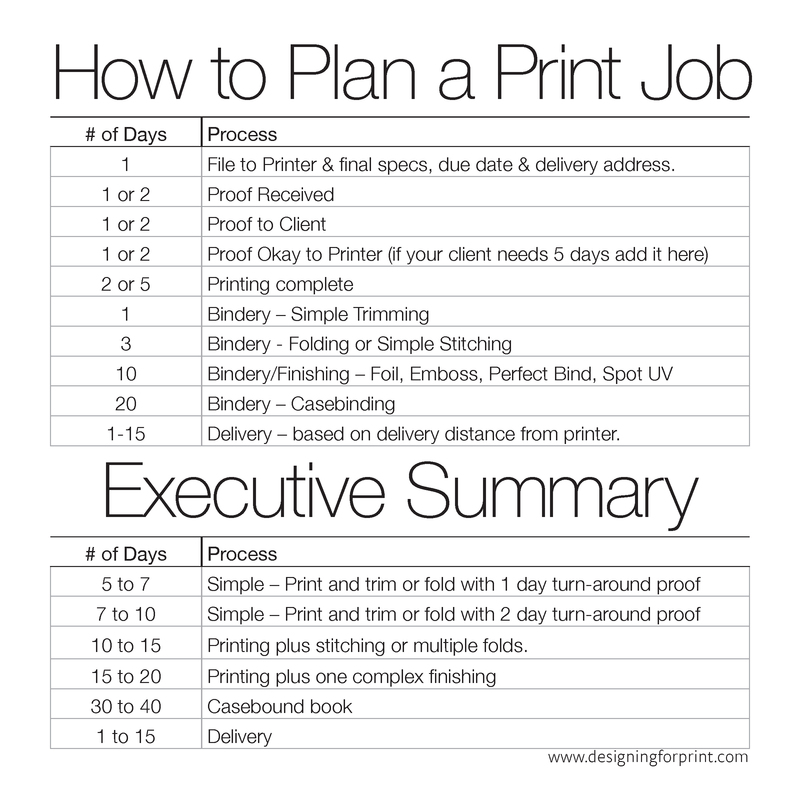 When you are planning a print job, the following schedule will work 99% of the time in a commercial sheet-fed environment. (Web printing can have a different schedule depending on run length.) I put this together to simplify a “ballpark” schedule. There are instances where this schedule doesn’t exactly fit, and I will explain some of those in a minute. Just bear in mind that the scenarios here will not fit 100% of print jobs. Exceptions to these timelines occur when running jobs on web presses. Depending on run length and paper availability, you might need to book your press time a month in advance. You also may be able to have much of the finishing done in-line on a web press which will save you time on the back end. If you get all the information to the printer on day one, your job will be far better off than if you piece-meal the information. For example: if you send the file to the printer and say that you will get back to them with final ink choices after the marketing boss/client/decision-maker gets back from lunch and chooses a palette, and you think something is going to happen on your job in the interim… nope. Not happening. Don’t assume that because you can design a file in one palette and switch it out in a minute in InDesign that your printer can do the same. Because they can’t. Don’t assume that your printer has some kind of MIS system that allows them to input your spot colors in Sales and that it updates a job ticket and alerts prepress. Because they don’t. It’s hard to remember that print is really and truly a custom manufacturing project but it is. And what that means is nothing happens until all the info has been captured. The number one problem with incomplete information is delivery addresses. Everyone thinks that it happens last so it can get to the printer last. In some companies shipping labels are printed at the time of order entry. And if that is the case with your vendor, the order needs to wait in shipping and return to order entry for shipping labels and then turn around and go back to shipping. You get my drift. Each type of proof takes a different amount of time. A PDF proof is quickest and the least accurate for things like color. A folding blueline takes a little more time and contract proofs with folding bluelines take even more time. Add on getting proofs to you and then for you to get them to the client and then getting them back to the printer and you can see how one day can turn into a week. Be proactive and find out who will okay proofs and that person’s availability when the proofs are ready. Are you and the client on two different sides of town? Plan ahead to meet at the printer or have the proofs shipped to you and you take them to the client. Working this out in advance can really be a big time-saver when the deadline is tight and there is no room for error. Don’t expect your printer to take three days out of their schedule if the client is on vacation and the proofs sit on a desk for three days. The other thing to remember with proofing is to know what you are proofing. All specifics like names and addresses and websites and etc. should have been proofed at the copy stage. Final proofing may be for color, pagination, die-cutting, or other bindery operation. And if you know your client/department/boss always makes changes and requires another round of proofs, tell your printer so that this is built into the schedule. Believe it or not, sometimes we have to wait for the ink to dry before we can cut your job. If it is printing on coated paper, it’s likely going through an infra-red (IR) drying unit and will emerge ready to cut. But if it is an uncoated sheet with a lot of ink on it, like solid coverage, there might be drying time involved before the job can be trimmed or bound. Most printers have a folder set-up for letter folding or a simple right angle. Complicated folding like a pharmacy fold or map fold takes longer to set up. Ditto for cutting. If you need a diagonal corner for example, that takes longer to set up, cannot be programmed into a cutter (yes, cutters are programmable, it’s super-cool!) and because it becomes a manual set-up and run operation it takes longer. Some bindery operations are more complicated and that’s why they take more time. Take foil stamping and embossing for instance; these techniques require a die, which needs to be made and proofed. Sometimes this take the same amount of time as the printing, sometimes it takes longer. Your printer’s production department has this planned out to the day, and sometimes the hour, and that is where your print rep is getting the schedule, straight from production. Trust your rep and don’t try to push for a different schedule. Also, plan on adding extra time for each finishing operation that happens. They often have to run in sequence, not simultaneously so each process can add another five days to the schedule. Case-binding takes much longer than perfect binding or stitching and there aren’t as many binderies that perform case binding. It’s a good possibility that your print job may even be going out-of-state for this finishing. Schedules that run a month or more out are not uncommon. Patience grasshopper! Depending on if your job is going to print sheet-fed or web, paper may take from one day to five weeks to arrive at the printer. Sometimes, the sheet-fed paper you specified is not locally available and needs to be ordered from the paper mill. In this case, it might take up to seven days for the paper to arrive, depending on which part of the country you are in. Most paper mills are in the Midwest, Wisconsin area. In California, it typically takes seven days to receive a mill order starting on Thursday—the day the paper merchant needs to get his paper order to the mill to make the truck that is leaving Friday. That means you have to let your printer know by noon on Wednesday. If your job is running on a web press expect it to take anywhere from one to five weeks for paper to arrive. Give your printer time to do the job right, give your paper merchant time to do the job right, and you will eliminate a great deal of stress and expense. In the best case scenario, you will know about a mill order’s paper situation when you are given the estimate. That way, you can order the paper on day one, give the printer the file on day two, the printer gives you a proof on day four, and then it’s just a couple more days before the paper arrives. By then, dies (if necessary) are made, and everything is ready to go. If the paper is in stock at the local merchant, it will be at the printer the next day. If the paper is at a local mill warehouse, it takes two to three days to get to the printer. Some terminology know-how is helpful when talking about paper availability. Local merchant means the paper is at the local merchant’s warehouse. Local Mill means the paper is at the paper mill’s local warehouse which may be in another part of your state. Mill warehouse means the paper is located at the paper mill and mill order means the mill needs to make the paper for your order. Winter storms affect trucking schedules. Be smart and add extra time to critical projects after snow is on the ground. As soon as you have narrowed down or decided on your choice of paper, order dummies. Even if it is a simple project, ordering dummies is an excellent habit to get into. at the end. Remember that proofs are an expense, and they can add up, especially for large projects that include numerous pages or require complex hand cutting. Do not expect your printer to “throw in an extra proof.” It’s a hard cost item, and he will not appreciate the hit to his bottom line. When you give your printer the estimate specs, let her know if you are going to need a press check. Unless you are printing highly unusual art with a special technique, you do not need to be at a press check. If your client requires it, find out if she wants you to watch out for something specific. One final word about scheduling and your print rep. Sometimes Printer A will tell you a job takes 15 days and Printer B will tell you it takes 10. Sometimes someone is not telling the truth and is already planning on calling you with some bad news in a few days about how there is going to be a delay. In my experience, that doesn’t happen very often. Why? Because good printers stay in business and good reps stay in the business. A good rep is a rep that tells you what you need to hear, not what you want to hear. And sometimes Printer B can do it faster, because of better equipment or more shifts, or more flexible plant scheduling or they really want your business and are willing to work overtime to get it. Only you, the savvy designer and print buyer will know the truth, caveat emptor! Do you have a story about a scheduling nightmare? I’d love to hear it, comment or contact me, we all learn from all the printing stories out there! Humans have been binding pages together since the second century. Bindery is a true testament to our desire to organize information and package it for convenience and safe-keeping. Modern bindery has some terminology that is good to know and modern bindery also has some pitfalls, the same pitfalls that have been around for nearly two thousand years! Number of Pages Believe it or not, this can get kind of crazy… the counting of pages. I have had customers who only count the printed pages, not the blank pages and customers who count the number of sheets of paper as the number of pages. Needless to say this can get very confusing when your are receiving quote specifications. When you count pages the total page count must be an even number. It is impossible to have a physical document with an odd number of pages. Both sides of a sheet of paper are counted. When referring to the page count, you do not count sheets. Instead, you count pages. Each sheet has two pages. The parts of a page, head and foot, recto and verso. Signatures A signature is a large sheet printed with a multiple of four pages. When it is folded, it becomes a section of the book. Signatures can be any multiple of four pages, but 8, and 16 are the most common for letter size pages. Imposition Imposition is the arrangement of pages on a press sheet in the proper order and orientation for the formation of signatures. Knowing imposition is important when designing features such as crossovers or large solid color areas on which you want exact color matches. Binding by stapling sheets together where they fold at the spine is called saddle stitching. Saddle stitching is economical and practical but has the disadvantage of creep. Your saddle-stitched booklet may have a cover that is thicker than the pages (this is referred to as pages plus cover) or the cover can be the same weight as the pages (this is referred to as a self-cover). You can have as few as eight pages saddle stitched or as many as 100 depending on the thickness of the paper. When a binding is saddle stitched, the signatures nest inside one another. Allow for creep in your design. When the book is trimmed to make it even all around, the center pages are going to be narrower than the front and back pages. This is referred to as “creep.” If you are producing a 12-page catalog, the “creep” might not make much of a difference. For instance, if the catalog’s pages are 100# book weight, the bound catalog will be 1/32nd of an inch thick. A graphic element that repeats from page to page (such as a page number/folio) and is 1/8th of an inch from the edge of the sheet will have shifted 1/76th of an inch in the center of a 12-page catalog. Creep is more noticeable in a 72-page catalog, which is 3/16th of an inch thick. In this case, the same element in the center spread has shifted more than 1⁄16th of an inch, or half of the distance between where it was positioned in the center spread and the edge of the page. The diagram below illustrates how noticeable creep can be. If your print provider is using imposition software, this difference will be adjusted in the prepress department by changing the size of the gutter or page width in very tiny increments. (Moving things in imposition is known as shingling). To avoid noticeable creep, place elements far enough away from the edge of the page so that the shift will not be noticeable after saddle stitching. Perfect binding and case binding do not have the same problems with creep as saddle stitch binding, but there are other factors to be aware of. The most critical is the thickness of the finished document. Perfect binding requires a minimum thickness that changes slightly depending on the machinery used and the type of glue. Basically, count on a minimum thickness of 1/8 in. to be successful. If you use fewer pages, you run the risk of the binding not holding together. Because perfect binding is far less costly than case binding and is similar in appearance, it is popular. Remember that when using perfect binding, the finished product does not lie as flat as books that have been saddle stitched or case bound. Therefore, allow more room in the gutter. “Lay flat binding” is a type of perfect binding with more flexible glue and a score on the cover to facilitate flattening the book, but it still does not result in as flat a product as other binding methods. When specifying paper for the cover of a perfect bound book, it is preferable that the paper be uncoated on the side that receives the glue, a C1s sheet or uncoated. Case binding involves gluing or sewing the pages together and then gluing them to a spine and cover that is rigid. An end paper holds the spine and cover to the pages. This paper cannot be coated and must be a minimum text weight of 80#. Because of the way smyth sewn books are put together, signatures of different page length add cost. This is why you might see a few blank pages at the end of a hardbound book. It may have been less expensive to just leave them there. There are more decisions to make when designing a casebound book. In addition to the cover and text paper there is the endpaper, whether the back (spine) will be rounded or flat, and whether or not there will be a headband or endband. Due to the heavier weight of a casebound book, there also might be a need for extra protection for the cover in the form of lamination or a dust jacket. A gatefold is a foldout that opens to double a page. A gatefold will never be joined end to end exactly where the two edges meet. Therefore, your printer will either leave a very tiny gap between the two edges or overlap the edges slightly. The degree of either measurement will depend on the thickness of the paper. Discuss with your printer how production will manage the gap or overlap and order a paper dummy so you can see the end result clearly before the item is printed. When designing a gatefold, keep in mind that the thicker the paper, the greater the likelihood it will pop open. Paper up to 65# will lie flat after folding, but nearly every paper thicker than that will tend to lift. Scores made with a steel rule die (die scoring) are often preferred for a gatefold because they yield a sharper crease and more precise parallel folds than rotary scoring made with a wheel. Although the panels of a roll fold appear to be divided evenly, that is not the case. For example, a trifold, or letter fold, appears to be divided in thirds, but actually the first fold is shorter than the center panel, and the last fold is longer than the center panel. This gives the finished piece the appearance of being evenly folded because the edges will line up. The size of the panels will be dictated by the thickness of the paper to some degree. If the paper is thin, 80# book for example, and your design elements are not critical, you may not even need to adjust your art. But if the paper is a thick cover weight and your design elements are critical, then you will need to discuss the width of the panels with your print provider. If you do not specify the width of the panels in your file, your printer will adjust the width in the bindery stage when placing the trim and fold. The greater the number of panels that roll in, the greater the adjustment required in the design process.